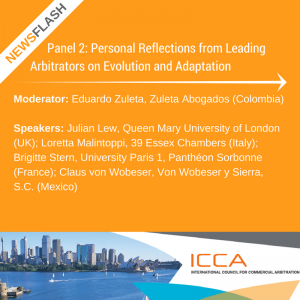 Newsflash: Introducing the Moderator and Speakers for Panel 2, ICCA 2018 Sydney! Speakers: Julian Lew, Queen Mary University of London (UK); Loretta Malintoppi, 39 Essex Chambers (Italy); Brigitte Stern, University Paris 1, Pantheon Sorbonne (France): Claus von Wobeser, Von Wobeser y Sierra, S.C. (Mexico). Session description: Modelled on a TED Talks format and involving a series of informal remarks delivered over the luncheon break, leading arbitrators will offer their personal reflections on the past, present and future of their careers and of arbitration itself. What would they have done differently knowing what they know now? Has arbitration taken the path that they would have predicted? How will arbitration look 10 or 20 years from today? What are the biggest challenges facing arbitration as a dispute resolution mechanism and its stakeholders as a community? Questions and observations from the floor will be encouraged.